Since its inception in August 1987, this world bond fund has been managed by James R. Mulally. He is the senior vice president of Capital Research and Management Company. The fund has $13.78 billion of total net assets. The annual expense ratio is 0.87%. There is a management fee of 0.23% and front-end sales load fee of 3.75%. It distributes 2.51% dividend yield which is paid in March, June, October and December. The most recent distribution was made in October 2012 ($0.10). It has 3-stars rating from Morningstar. The shares price is $21.02 (1/1/2013). This world bond mutual fund has YTD return of 7.29%. 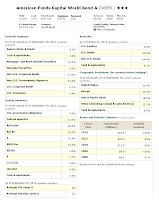 The fund has returned 3.93% over the past 1-year, 4.46% over the past 3-year and 7.05% over the past 10-year. Since its inception, the fund has recorded in 19 years of positive return and 5 years of negative return. The 3-year beta risk is 0.79. The fund’s benchmark is Lipper Global Income Funds Average. The minimum initial investment for brokerage account is $250 and minimum of $50 for the next investment. The same amount applies for retirement account. This CWBFX fund can be purchased from 81 brokerages, such as Merrill Lynch, JP Morgan, E Trade Financial, UBS Financial Services Inc, LPL SAM Eligible, Ameriprise Brokerage, Schwab Retail, Royal Alliance, etc. This taxable bond fund is available in many other classes such as Class B (WBFBX), Class C (CWBCX), Class F-1 (WBFFX), Class F-2 (BFWFX), etc. The top geographic breakdown as per September 2012 is 33.7% in Europe, 31.4% in United States and 18.9% in Asia & Pacific Basin. 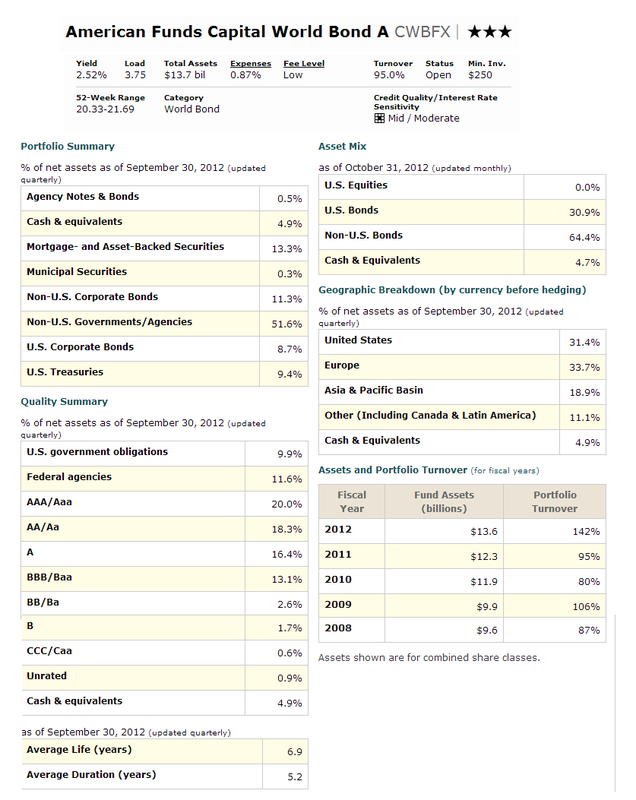 The top portfolio summary is 51.6% in Non-U.S. Governments/ Agencies, 13.3% in Mortgage-and Asset-Backed Securities and 11.3% in Non-U.S. Corporate Bonds. Per fund prospectus, the principal risks are market conditions risk, investing in bonds risk, thinly traded securities risk, investing in lower rated bonds risk, currency risk, investing outside the United States risk, investing in emerging markets risk, non-diversification risks, management risk, etc.